From left to right: Katie Shepherd, Jonathan Strazza, Tammy Kolbe, Alyssa Barnes, and George Salembier (not pictured, Jonathan Sessions). School-based decision making teams play an critical role in helping teachers respond to diverse student learning needs. Vermont was one of the first states in the country where schools widely adopted decision making teams as a strategic resource assisting teachers and students. Although these teams have become nearly universal in schools nationwide, little is known about how they function, and in what ways school conditions influence their work. 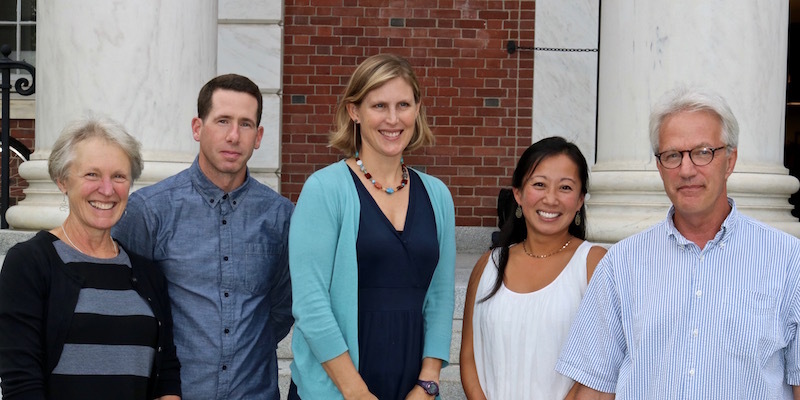 The Spencer Foundation awarded a grant to the UVM College of Education and Social Services (CESS) in 2013 to support an in-depth study of five decision making teams in three Vermont elementary schools. CESS Professor Katie Shepherd, Department of Education Chair George Salembier, and Assistant Professor Tammy Kolbe are co-Principal Investigators for this study. Three students in the CESS Educational Leadership and Policy Studies doctoral program - Alyssa Barnes, Jonathan Strazza, and Jonathan Sessions – are also involved with the study. “We want to learn what constitutes high quality collaboration and functionality in decision-making teams," said Salembier. Decision making teams rely heavily on a wide range of student performance data and a collaborative problem solving model to develop instructional interventions for students who are experiencing a range of challenges including academic, social-emotional and behavioral challenges. Additionally, these teams can provide opportunities for teachers and other school personnel (e.g., literacy and math coaches, guidance counselors, school social workers, etc.) to learn from one another and to coordinate their efforts to support students and families. The research includes interviews with key stakeholders as well as observations and analysis of all aspects of how teams collaborate, including their roles, responsibilities, interactions, communication, decision-making processes, data utilization, methodology, and outcomes. “This is a very deep look into their collaborative process from start to finish,” said Salembier.